I always feel like in life, you’re in a constant state of proving yourself to the people around you. In grade school, you try to prove that you’re the coolest or toughest kid on the playground. In middle and high school, you prove that you’re fearless by accepting dares. In college, you strive to prove yourself to professors and bosses and potential bosses. And when you enter the working world, the post-graduate life, you find yourself having to prove your worth to everyone: your parents, friends, employers, and really, society at large. If life is a constant series of proving your capabilities and worth to the people around you, then our Suits characters know this better than anyone. “Breakfast, Lunch, and Dinner” focuses on two almost interchangeable notions: proving yourself and pride. 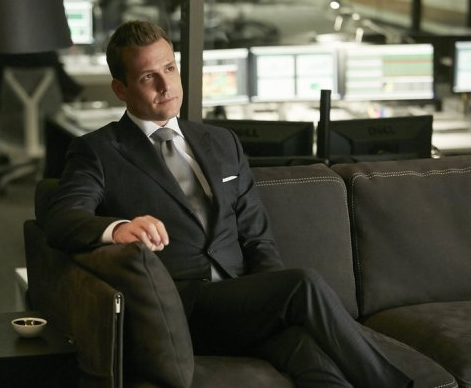 Mike Ross has turned into a stubborn and prideful character apart from Harvey. Now, that’s not necessarily BAD and it’s not to say that Mike was selfless when he was at Pearson Specter. But he’s beginning to learn – and we are beginning to see – that pride goes before a fall and when you fall out in the real world, you often take other people down with you. Elsewhere in the episode, Louis is competing with Jeff Malone to prove himself to Jessica, while Rachel is trying to prove that she can handle not letting a case come between her and Mike. Mike, meanwhile, is also trying to prove that Rachel’s relationship with Logan doesn’t matter to him. And what happens, of course, is that everyone discovers a little bit about themselves that they wish they hadn’t in their attempts to prove themselves. In “Breakfast, Lunch, and Dinner,” Mike and Rachel discuss their relationship and set the ground rules for its potential convergence with their work relationships. The problem, of course, is that Harvey’s client is Logan – the guy with whom Rachel once had an affair. Mike spends the entire episode puffing himself up, strutting around Pearson Specter and challenging Harvey. He isn’t just determined in this episode or driven. No, Mike was driven in the season premiere because he demanded respect from his former mentor. In this episode, Mike was shaken down by Harvey and Logan, and as a result, Mike let his pride get the best of him. With attempting to prove himself to Harvey and to Rachel and to Logan and to his new investment banker client and boss, Mike drove himself straight into a corner, one which was costly and painful to get out of. This side of Mike – this stubborn version of himself – is one that we haven’t seen often. When Mike was practicing as a lawyer, he utilized the tricks and trades he learned from Harvey and then paired them with his photographic memory (did we just drop that facet of his personality altogether somewhere along the series?) and stuck his neck out for his clients, seeking to prove his value to Harvey and Jessica. This episode? This was different; this was a side of Mike that we rarely see. He was careless and made an error that ended up costing his client his dream. And yet, Mike was determined to prove to Harvey, to Rachel, to Logan, to his client, and – most importantly – to himself that he was a viable threat to the people around him. Mike wanted to be taken seriously, as his conversation with Harvey at the end of the episode indicates, but he also wanted to be seen as a problem. He didn’t want to be brushed aside, knocked out in the first round by a stealthy move by Harvey Specter. No, Mike wants, this season, to have it all. He wants to have a relationship with Rachel that isn’t damaged by the fact that they are working for opposite sides (the truth is that this WILL impact them, as we got glimpses of tonight), he wants to garner the respect of Harvey, his new boss, and his client, and most importantly, Mike wants to WIN. I don’t know how Mike’s characterization will pan out over the course of the season, but I’m intrigued, given his development in the first few episodes alone. He’s being a bit reckless in his efforts to prove himself and he’s being a tad stubborn too. But at the end of the day, he still manages to find a way to keep himself in the game. And perhaps that is what he needs most of all at this point: to just stay in the game. There’s an episode of How I Met Your Mother entitled “Subway Wars,” and throughout it, it is explained why each of the characters “needs a win.” I feel like Louis Litt has needed a win for the last year. As I stated in last week’s review, he was never my favorite character. I often saw him as sniveling, conniving, and sneaky; I didn’t trust him because of that. But as Louis became more fleshed-out as a character and I began to see his vulnerability, I actually found myself empathizing with him. I wanted to see Louis earn the respect and trust of Jessica and Harvey. I wanted Mike to choose HIM as his mentor. In spite of Louis’ often eccentric personality, he is a genuinely decent person at heart who just wants to be noticed. The problem is that nearly everyone at Pearson Specter fails to take notice of Louis. They don’t give him or his role in the company any weight and instead, they overlook him in favor of rewarding others. So when last week’s episode saw the introduction of Jeff Malone, an SEC prosecutor, I knew that Louis was about to either go toe-to-toe with the man who stole his office and job away from him or Louis was about to get brushed aside as an afterthought while Jessica favorite Jeff. “Breakfast, Lunch, and Dinner” saw both of the aforementioned events occurring. While Jeff and Louis managed to put aside their differences during an interrogation after going toe-to-toe in an argument beforehand, Louis was not happy to see Jeff steal both the office and the attention away. It’s not for the sake of pettiness that Louis wants the corner office or Jessica’s recognition – it’s because he has suffered so much over the past few years and built himself up after his betrayal that he feels he NEEDS those things in order to feel a sense of value and purpose again. He wants, needs, and deserves to feel at home at Pearson Specter. But what’s really intriguing is that in his desire to be respected and to prove his worth, Louis ventures down a road he would never normally frequent: he puts the life of a human being on the line in order to settle a score with Jeff. Donna, bless her heart and her light, confronts him about his behavior. She is the one to walk him away from the edge; she is the one who tells a personal story about how her jealousy brought out a side of her that she didn’t even know existed. It’s a powerful message for Louis to hear and a powerful one for us as well. Our pride and our egos and our jealousy can lead us into dark places we never thought we would end up. It’s a very dangerous balance: too much pride can blind us and be our undoing. So Louis takes Donna’s advice to heart and Donna approaches Jessica with a proposition: they need to show Louis he is appreciated by bestowing the corner office on him. Jessica agrees and Louis moves into the office, but not before giving Jessica a huge hug and breaking down in tears. The women of Suits spend the episode trying to prove points: Donna tries to convince Louis that his jealousy will only lead him into a dark, dangerous road that he may never recover from. She tells a story of how she wished something bad would happen to the girl who was supposed to play Ophelia in Hamlet, as she was the girl’s understudy. A week later, the girl’s father died. When Louis tries to convince Donna that she was not the one who caused the father’s death by wishing ill on the actress, Donna agrees. She knows she didn’t cause that girl’s father to die, but she also realized how jealous she truly was and how that jealousy – that thing everyone thinks is rather silly and harmless – revealed to her a Donna Paulsen that she didn’t even know existed. The truth is that we never know what we are truly capable of until we’re forced into situations that extract certain emotions from us. Donna’s minor (and yet major) role in “Breakfast, Lunch, and Dinner” was so integral. I always appreciate Sarah Rafferty in this role but she was phenomenal tonight in her story with Louis. The friendship between these two is one of the most solid elements about Suits. Elsewhere, Jessica is trying to prove to herself and to Jeff Malone that she will not slip up and sleep with him – her attempts to convince herself and her new employee that she is in control seem to be lost on the former SEC prosecutor. He’s convinced that she wants him and will eventually admit to that; she’s convinced that she has a handle on both their work and personal relationship. I suppose only time will tell which one of these characters is correct. Meanwhile, Rachel and Mike are beginning to realize that their relationship will have new complexities, especially now that Rachel is working for a firm that also happens to be representing the man she once had an affair with. But she is convinced that she and Mike can manage their personal relationship and separate it from their work one. When Mike turns down Harvey’s (arguably good) offer, the two significant other spat, as Rachel wonders aloud whether Logan’s involvement is why he turned the offer down. It’s clear that Mike has issues with Logan and Rachel being in the same firm at the same time, but he will not or cannot fully vocalize them to Rachel yet. Instead, Rachel continues to try to prove her value to Harvey while simultaneously proving her loyalty to Mike. From the looks of it, their complex relationship is about to grow more complex soon. Clearly, the characters on Suits are desperate to prove their value to the people around them – to their bosses, significant others, clients, friends, and even to their enemies. It’s an action that we can all relate to and I’m intrigued to see how relationships will either fracture or grow as a result of these desires. I love that Donna stole tulips from Rachel because they were pretty. “My diary is for my most agonizing defeats.” That entire scene was GOLDEN. I’m beginning to love Katrina and Amy.